Click HERE to view the map in its frame. MAP MAKER: Pieter Van der Aa. SIZE: 9" X 5 3/4". Pieter van der Aa; 1659-1733. Van der Aa, started his own bookmaking shop in Leyden in 1672, publishing an enormous amount of materials. He did branch out seriously in the atlas business in 1707, probably on account of the strong interest for geography with the Dutch public of that time. The golden age of the East India Company was over, but international trade was still a major economic trump for the Low Countries. His cartographic knowledge and skills were rather limited, but he borrowed extensively from the masters of the art. His maps were quite decorative, and made the success of "Atlas Nouveau et Curieux" in 1710, and above all of the 27 volume "La Gallerie Agréable du Monde" in 1729. 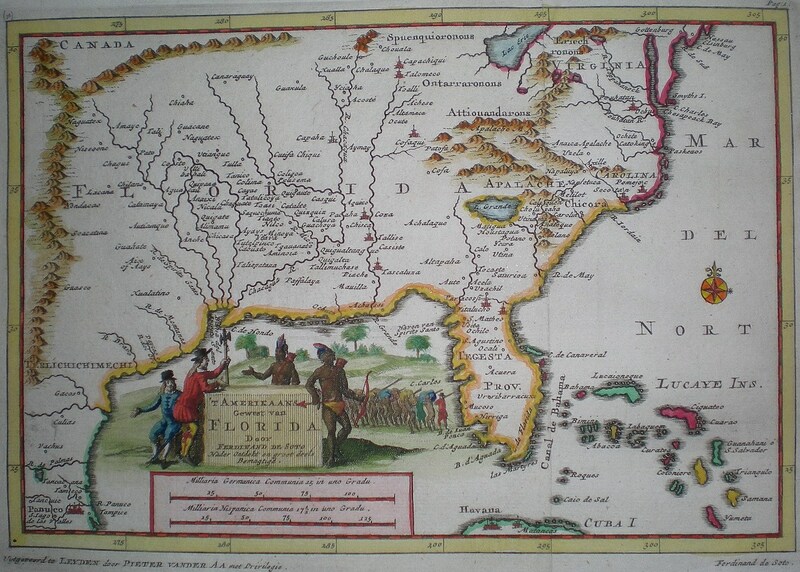 This small map (8 15/16" X 5 15/16") was originally prepared by van der Aa for inclusion in his 1707 "Naaukerige Versameling der Gedenk-Waardigste Zee en Land-reysen na Oosten West Indien". This particular example seems to have been printed for "Cartes des Itinéraires et Voyages Modernes"; issued in the same year. 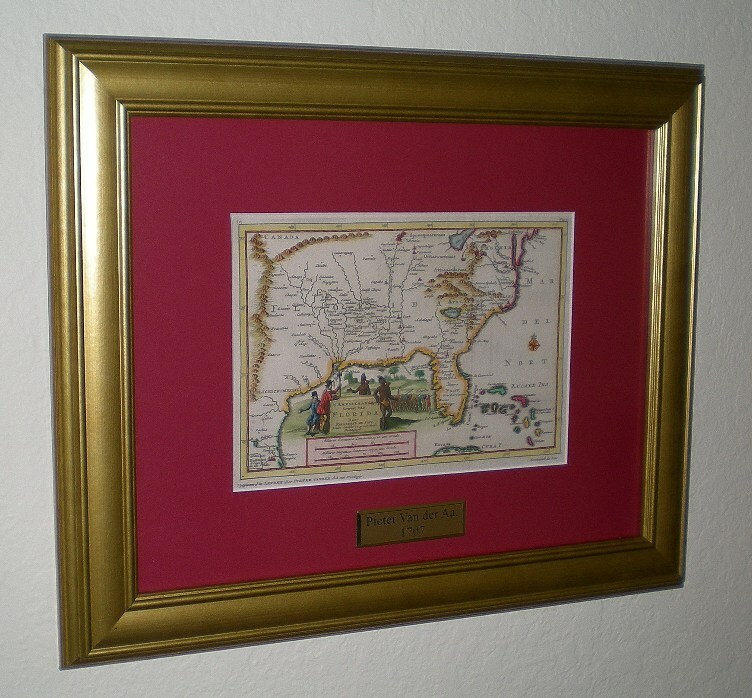 The same map was recycled in the 1710 "Atlas Nouveau et Curieux";, which was re issued twice, in 1714 and in 1728. The peninsula delineation is very much in line with the 1656 and 1657 Sanson seminal maps. It exhibits also the same topographical errors (notice the east-west mountain chain), the wrongly located mouth of the Mississippi (Spiritu Santo River), the fantasy hydrography (mythical lake, interconnected rivers,...). 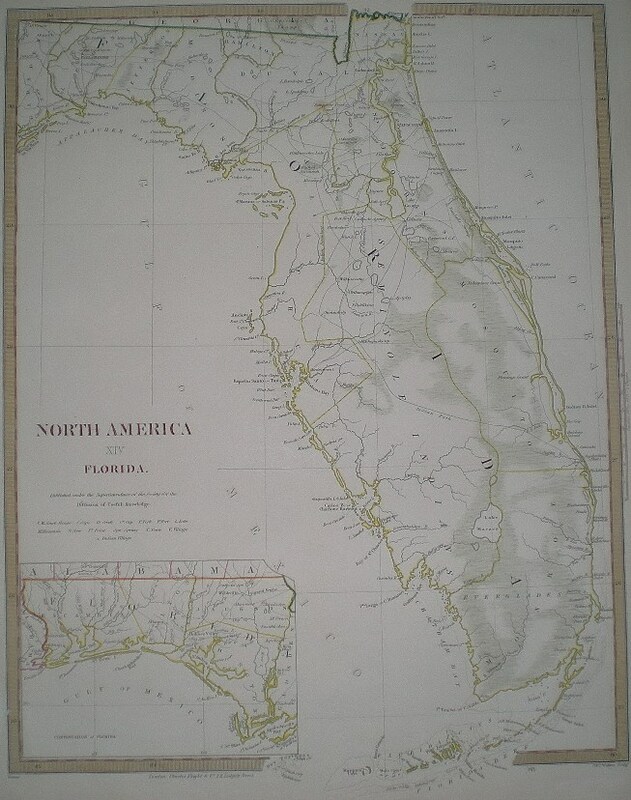 Notice also that by that time, present day Florida was known as the Tegesta province. The cartouche is an allegory of De Soto travails during his expedition from Tampa Bay in 1539, to the Mississippi where he died of fevers in 1542. Here we see him negociating thru interpreter Juan Ortiz (one of the four survivors of the Narvaez expedition eleven years earlier) with local caciques for the hiring of porters. Afret his death, the remnants of his expedition crew built small boats and made it to Tampico a year later. The failure of the enterprise made the King of Spain to proscribe future colonization attempts in Florida.